This past weekend I participated in the "First Brush of Fall" Paint Out in Converse, Indiana. I especially enjoyed visiting the sunflower fields at Boyer Farm which is also the location of the Powell Homestead Cabin built in 1848. I can only imagine what it has been like for this family to live on this beautiful farm for so many years! "Where flowers degenerate man cannot live." 30 Paintings in 30 Days done! Woohoo!!!! Oil on Canvas 18" x 24"
"The need to express who we are is archetypal; that is both necessary and timeless. And expressing who we are is less about describing ourselves than it is about letting who we are out in a regular rhythm that is as imperative as breathing. for by telling our stories and listening to the stories of others, we let out who we are and find ourselves in each other, and find that we are more together than alone." and maybe we can be reminded to be thankful for what we have. It must give birth to a world. A friend of my asked me to create a painting of her favorite flower, Gladiolas. Oh this most difficult and unusual flower! Here are three attempts I have made at it... I think I like the last one the best. Wisdom always breathes, there are exceptions to everything. Oil on Canvas 24" x 36"
Over the years I have compiled a series of paintings called "A Celebration of Sexuality: A Study of Gender." In it I explored the fine lines between what is feminine and masculine, what unites and divides individuals who are in romantic and sexual relationship to one another, as well as my own desires. Probably the happiest period in life is in middle age, when the eager passions of youth are cooled, and the infirmities of age not yet begun; as we see that the shadows, which are at morning and evening so large, almost entirely disappear at midday. I also often like the middle stage of a painting. When the foundation is solid, I can start having fun with the colors, and am in the homestretch. To acquire knowledge, one must study; but to acquire wisdom, one must observe. And then going back to the drawing board. you unlock blessings to flow in your life. You've got to get to the stage in life where going for it is more important than winning or losing. Creativity is always a leap of faith. You're faced with a blank page, blank easel, or an empty stage. This new *free* Steps to Painting Mini-Course is available exclusively to my newsletter subscribers. This includes a PDF ebook and video to guide beginning students through the process of creating an oil or acrylic painting. When I created this painting last month I got together with a couple of other artist friends. We chatted and ate cookies as we painted. Each artist's painting turned out so differently! soon slays with parching power." This small study on paper is one of those experiments in technique. I was going for a flamboyant wallpaper-ish design... but honestly I am not pleased with the result. Even though many botanical prints lack a background color in this piece I feel the absence of it. Oh well. It is during these 30 day challenges that we experiment. Some pieces are more successful than others. I have become obsessed with "Fraktur" art lately. Fraktur means "broken letter" and refers to the distinctive calligraphic font used in these pieces. These are usually birth certificates and house blessings made by people of German ancestry in the Pennsylvania area. They used black ink for the general design, words and outlines filling in occasionally with colors. By the way the "Haus Segen" designs morphed into the now common "Home, Sweet Home" posters. To see many amazing historic Frakturs read the book "Fraktur: Folk Art and Family." Or for a more hands-on workbook on how to create your own Fraktur read "Fraktur: Tips, Tools and Techniques for Learning the Craft." I shared this art form with my elementary age students a few weeks ago. We used quill pens to create our designs. They loved it and have a new appreciation for modern pens! the sage place where we can go as we are and not be questioned. I did this African Violet sitting in the window of my studio. Their rich velvety texture it difficult to capture! I love their quiet beauty. "If you don't go after what you want, you will never have it. If you don't ask the answer is always no. If you don't step forward you are always in the same place." 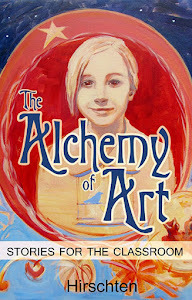 I wrote this book while teaching art classes for the Indianapolis Art Center. While the students created their daily projects I would read art stories to them. I am happy to announce that this collection is now available to be shared. If you enjoy it please write an Amazon review and share with fellow art lovers. The original painting on the cover of the book is of my daughter. It is named "Birdhouse in your Soul" after the "They Might Be Giants" song. "It is the artist's business to make sunshine when the sun fails." In other words things are what they are. But it IS a painting of a pipe. So my rose isn't really a rose. 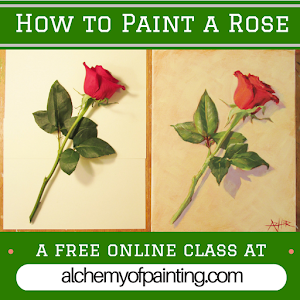 BUT I can safely say that I understand my rose better after having communed with it to create the painting. Summer's lease hath all too short a date. The act of painting is about one heart telling another heart where he found salvation. 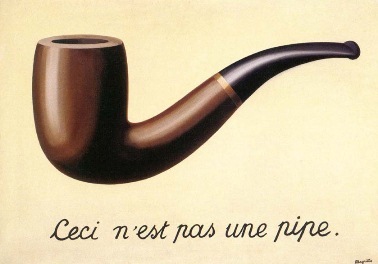 This painting is so very idealistic it hurts! It is belongs in the room of a young girl. My grandmother and mother made me a quilt of these same colors when I was a child. Feminine and ornate this painting reminds me of the Palace of Versailles and Baroque style. The flowers that were in front of me last night as I painted it... they are the objects that are so beautiful they are my salvation. They are my comfort. A contemporary artist can use the findings of all epochs and all styles, from the most primitive literary expressions up to the most refined products of the baroque. Green was the silence, wet was the light. for their feet are dusted with spices from a million flowers. And how good is their sight I ask you? to me those have always been the two most beautiful words in the English language. In the meantime I'll give it a shot. A single rose can be my garden... a single friend my world.